I recently acquired a 2015 11-inch MacBook Air base configuration (1.6GHz i5, 4GB of RAM, 128GB SSD) for a great price to use as a backup Mac and to take with me when I’m traveling to destinations I don’t need, or want to, take my 2016 MacBook Pro. My first Mac was a 2010 11-inch MacBook Air and I’ve always loved this model. It’s nice to have one again. When I was setting up my “new to me” MacBook Air I had a hard time getting the color calibration right. Even in expert mode, I just couldn’t get it to look right and being moderately color blind made it really hard to go calibrate. Recalling the first 11-inch MacBook Air I owned almost 8 years ago, I knew there were two manufacturers of the LCD: Samsung and LG. The Samsung panel seemed to have better colors while the LG panel was more washed out. The results should return three lines (in High Sierra). You want to look at the first line, where you will see a code. If it begins with “LP” you have an LG panel while if it begins with “LSN” you will have a Samsung panel. In my case I have an LG panel (LP116WH4-TJA3). Please note that depending on the model year and size of your MacBook Air the above Terminal command may or may not work. 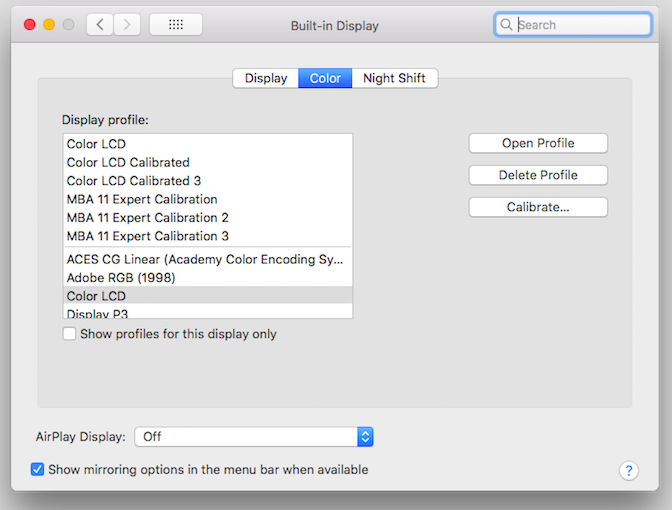 Many people were able to calibrate their LG screens and there was a custom color profile posted on MacRumors. This really helps if you have a hard time calibrating your display or have some color blindness like me. The original file as linked in the forums is now gone (or I was unsuccessful at finding it), but it is still available at Github. Since I couldn’t find many other places it was available I thought I would also add it here. Once this folder opens up in the Finder, just copy the color profile file into the folder. Enter your password if you are promoted to do so. Once you’ve done this go to Settings -> Displays and select the Color tab. You will see a bunch of color profiles. The one you want to select is the new profile that will be under a line and should so up as a second Color LCD profile. Select this one and you should instantly see much better color reproduction for your MacBook Air LG screen. The above is where you need to go in macOS settings and the color profile you need to select after you install the new one. The updated profile is the select Color LCD in the image above (you can see that I tried to calibrate my screen a few times). Overall the custom profile was able to get the colors looking a lot better for me than any calibration I was doing on my own. I hope this helps out anyone who might be looking for a similar solution.